Particularly interesting is the story of Tesla. That said, the obligatory electrics (Leaf) don’t have enough range to be practical. The range-extending Volt is interesting but after the first 35 miles, it gets only 32 MPG and runs on premium gas, not anywhere near what a Prius will do at half the purchase price. It’s VERY expensive. I stood stunned and shuddering at the window price like a hound dog passing a peach pit. And rigging your garage for it is also VERY expensive. But mainly (hangs head) it’s………”plain” (like a mechanical version of Romney). It’s a standard boring four door sedan people haul bodies out to the woods to bury every day. It’s……. (sulks) boring, and I’m constitutionally incapable of driving a boring car. So I had pretty much resigned myself to a Prius, also a boring car but not quite as sad as the Volt. Just another four-door sedan. Blah. Back in the 80’s, a forgettable film starring Richard Dreyfuss called “Tin Men” pitched Richard in a 60’s Cadillac dealership working a deal on an Eldorado like an Arab trader, when a little Volkswagen cruised by prompting Dreyfuss to wonder out loud “What’s that”?. Similarly, I keep seeing little Fiat 500s drive by and I keep saying, “What’s that?”. 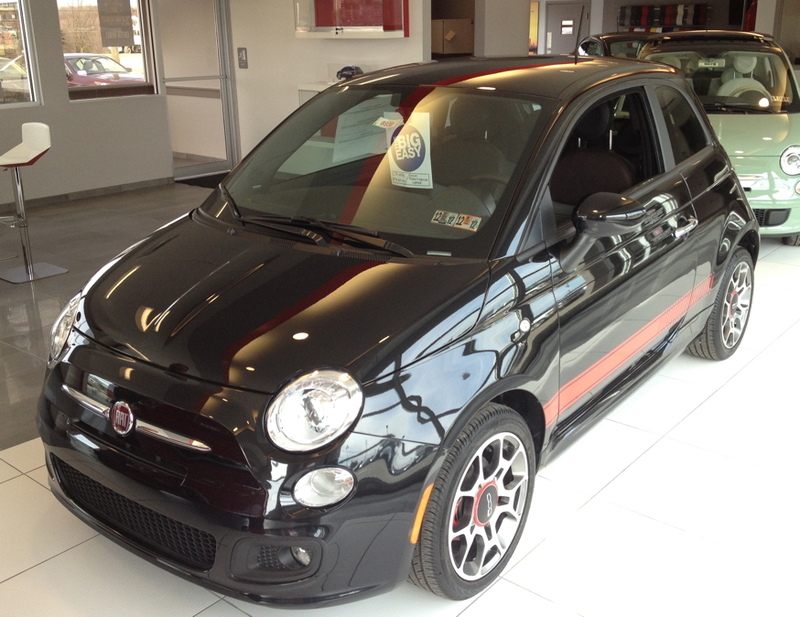 So having little else to do this week, I drove over to the new Fiat dealer here to have a look. I was astounded. It’s perfect. Two-doors with a space in back is all I need for an in-town runabout for getting back to work and going to the store for something. Anything more is wasted space and weight. Here’s what you get for a paltry US$20,000 (chump change for a full featured car). · 2” head room for 6’ 1” driver (me). A check of the Internet reviews say many drivers get from 38-40 MPG on the road on regular unleaded (driving sanely at 70 mph) and 30-32 MPG in town. · Guarantee buy-back at 105% of market price if I choose to trade it in at any time in the future. The Prius costs at least US$30,000 for a car with the same features, possibly more, and it’s gets about 40-42 MPG in town. Do the math as to how long it would take you to make up the difference in purchase price. The Volt isn’t even on the same screen. So I bought the one that caught my eye on sight. Call me impulsive. If you want a Fiat hot-rod, the Abarth will be available this summer. 160 HP turbo, but for a general-purpose car, that makes no sense. That’s why I have a Lotus Elise sitting in my back garage. This entry was posted in Cars and Motorcycles. Bookmark the permalink.